Poll Results: Is the mainstream media biased and if so, does it impact how they report the news?
. 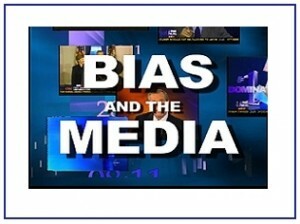 Tags: Bias, Jim Blasingame, media, Poll, results. Is the mainstream media biased and if so, does it impact how they report the news? 8% - The media are not biased and reporting is fair across the industry. 83% - The media are biased toward Democrats enough to influence their reporting. 6% - The media are biased toward Republicans enough to influence their reporting. 3% - The media seems to have a Democrat bias, but it does not impact reporting. For many years, surveys of members of the media have revealed that the vast majority consider themselves liberals and, therefore, likely Democrats. Over the past thirty or forty years, these statistics, as our own polling seemed to indicate, have increasingly manifested as biased reporting. And you don’t have to take my — or 83% of my audience’s — word for it. There have been a number of cases of high level bias so flagrant that sometimes jobs were lost and careers ended once exposed. In other cased jobs should have been lost but weren’t, like when CNN’s Candy Crowley became part of Team Obama in the 2012 debate she moderated against Romney. More recently, the bias has been evident in the media’s failure to report on certain issues because it would have been negative toward one of their ideological causes or individuals. Like very little reporting on four dead Americans in Benghazi, while during the same period doing hundreds of reports on Gov. Christie’s Bridge-gate incident, which inconvenienced commuters. More than a few observers have gone so far as to call the mainstream media corrupt. If this is true, and I wish I could argue with these people, America is the weaker for it. When you consider the state controlled media in Russia, Iran, China, and North Korea, it’s easy to see that an impartial media is essential to liberty and democracy.